The Super Bowl is in two weeks. The Patriots versus the Falcons. 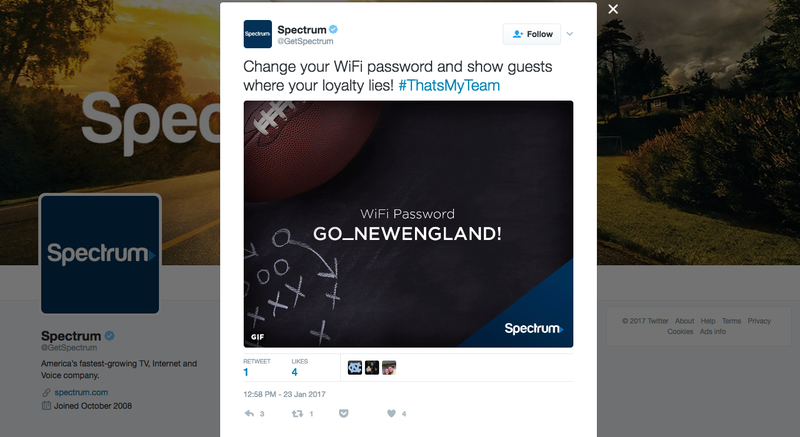 And Charter Communication’s Spectrum service wants you to change your wifi password to support your favorite team! Don’t change your wifi password to GO_ATLANTA or GO_NEWENGLAND. That’s terrible advice. As always, use a unique password, and if a bunch of strangers end up at your Super Bowl party, change the password after the game — or even better, enable the guest SSID found in most routers. Want to show your support for your favorite team? Hang a banner or write it on your face. Wi-Fi security is paramount to personal privacy and the second largest cable and internet provider in the United States is throwing that out the window by advising customers to change their Wi-Fi password to one of two options. Ever want to jump on your neighbor’s network? Try during the Super Bowl.